The friendly debate between the Independent and International School of Seychelles (ISS) on Tuesday reached a tie as both teams successfully argued their case. Vadrine Boulle of the Independent School and Karen Doku of the International School were both named best speaker of the debate. Despite there being no winning team the activity served its purpose; to increase inter-school relationships and promote education outside the classroom. 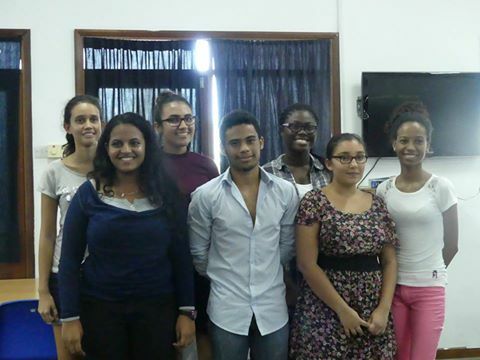 Four students from the International School of Seychelles (ISS) argued the case that the Stalinist regime in Communist USSR was more totalitarian than the Nazi regime in Germany. Students from the Independent School on the other hand argued that Hitler was the more totalitarian ruler. The debate took place in one of the ISS classrooms on Tuesday afternoon, with several attendees who included students from the two schools, some parents, and teachers. The students started nervously and tentatively, as each speaker took their turn to make their four minute speeches to rest their case. By the time they got to the rebuttals however, the debate had gained momentum and the students became comfortable enough to speak up and present their arguments. Some were more confident than others in public speaking, while some of the less eloquent students had all their facts and figures right. The debate centered mostly on the very definition of totalitarianism, and how many victims fell to the hands of each leader – used often to measure how dreadful one leader was in comparison to the other. Others still chose to centre their arguments on how much leeway each ruler gave to their followers, and how much of the people’s personal lives were dictated by the totalitarian leaders. Independent School teacher Selvi Karunakaran and ISS’ English Second Language teacher Tracey Gordon served as judges for the debate and found it difficult to pronounce a winning team. In an effort to keep things fair, the crowd was given the opportunity to ask two history related questions to the debating teams, who would each get one minute to argue their case. One student asked which leader had a harder time reaching the status of totalitarian dictator, while one teacher asked who was more successful at brainwashing their own population. This exercise helped to see which team could process information quickly and argue their case without any prior preparation. Still, the judges were torn. Everyone was a winner that day, as the judges called for a tie. “We appreciated all those who have organized this and all the research and time it took to make this debate happen”, Mrs. Karunakaran said when explaining their reason for calling a tie. “Each team did a great job at preparing and no one seemed nervous. Everyone was confident in their arguments. The International School debated the phrase well, they defended their argument better but the Independent School supported their claims on Hitler successfully as well”, she concluded. More than just an opportunity for a winning and losing team, this activity served its true purpose; to give students a reason to do extra-curricular work and research and sharpen their public speaking skills outside the classroom. In addition, this was an opportunity for students from both schools to be involved in something constructive and further improve ties between both schools. It is the hope of both schools’ head of History that in the near future public schools will be interested in participating in these activities. The Independent School students who participated in the debate were Vadrine Boulle, Stephanie Ah-Cheen, and Alissa Manty. The ISS students who participated were Evita Auguste, Karen Doku, Catherine Lodoiska, and the only boy participant – Eric D’Souza. From Today In Seychelles article by Kathleen Pillay.